Spring Thaw 2018, oil/aluminum, 34 x 44 in. 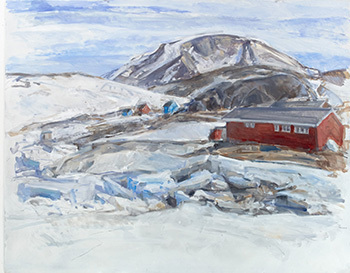 Marcia Clark's new paintings were inspired by a recent visit to Greenland during the annual spring thaw. In paintings of various formats, the artist conveys the natural metamorphosis through active brushwork and shifting forms and rhythms. The exhibition includes three small folding screens that occupy physical space, mimicking the painted bends and turns of the landscape. Marcia Clark has exhibited at venues that include the American Academy of Arts and Letters, Museum of the City of New York, the Hudson River Museum, and Albany Institute of History and Art as well as venues in Canada, Greenland and Iceland. She was a recipient of the Childe Hassam Award, a National Endowment of the Arts Artist in Residence grant, and has written for Smithsonian Magazine, retracing the travels of Thomas Cole, ﬁrst of the Hudson River School painters. 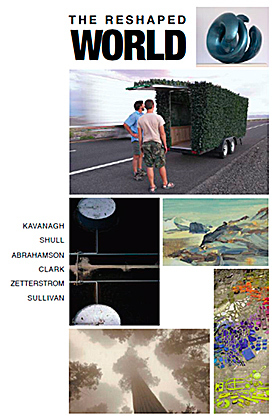 Clark has a BFA degree in painting from Yale University and a MFA degree from SUNY New Paltz. Completed on September 6, 2015, the mural wraps around two sides of a large shipping container. It can be viewed most directly as one approaches the Children's Home, but is visible from quite a distance. 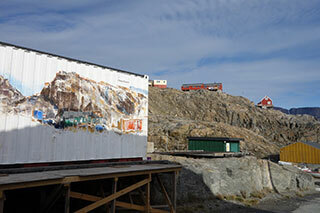 At the end of my visit to Uummannaq last year, the director of the Children’s Home had asked if I had any interest in painting a mural on a rather disreputable-looking shipping container they passed every day. It proved to be an engrossinging project. At first I considered masking all four sides, but it turned out to be much simpler just to paint directly on the metal. Besides, its grooved metal surface presented a unique challenge. There was only a short time to complete the project, given our schedules and the expected arrival of cold weather in September. I was in Uummannaq exactly four weeks. I planned to paint the landscape that could be seen from the container, or that the container could see if it had eyes. The scale, the grooves, and the fact that it was something you walked past, made a strict perspective impossible, since it changed whenever I moved. A truck in the foreground either elongated or drastically shortened depending on where I stood. Many elements demanded constant adjustments until they finally seemed plausible. "Just about plausible" was, in fact, the key. The entire process was thrilling – all those almost plausible elements functioning together in a sequence that reflected my own experience of a remarkable place. 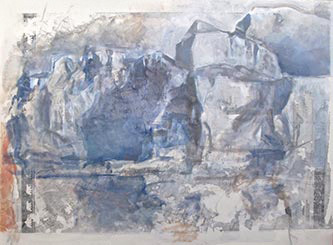 Uummannaq Folding Screen 2014, oil on panel, 16" x 72 "
Opening Reception 7 - 8:30 on Thursday. February. 4. Blue Mountain Gallery is pleased to present paintings inspired by Marcia Clark's recent visits to Greenland and Iceland. 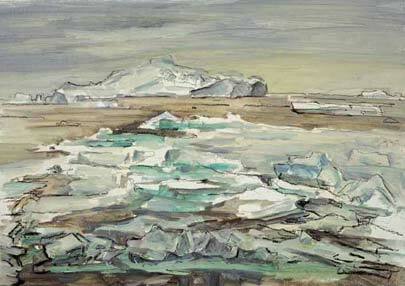 With loose strokes and a new intensity, the artist captures scenes of icebergs clogging Disko Bay. She approaches her subjects from fishing boats as well as from the tundra above. "I keep returning to the Arctic and am captivated by the beauty of what I see" states the artist. "But what was once excitement, as I witnessed the extraordinary and new, holds the poignancy of a moment captured that’s passing away." 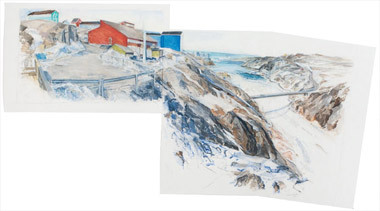 An exhibition of icescapes painted in the environs of Ilulissat, Oqaatsut and Saqqaq. Clark has been painting the Greenland landscape with a focus on the ice since 2007. Her project complements that of the Danish artist, Emanuel Petersen (1894-1948), whose depictions of Greenlandic light and atmosphere comprise the permanent collection of the museum. 2011 oil over map transfer/canvas 36" x 60 "' Marcia Clark's repeated visits to the Arctic over a fourteen year period made it increasingly apparent to her that irreversible changes were taking place. Most of us can only know what is happening to our planet by means of statistical reports that are often conflicting. 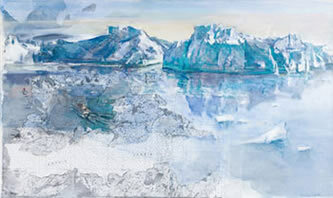 Through the artist's willingness to submerge herself in a harsh and challenging environment and thanks to her consummate but unostentatious artistic powers, we are made to feel not only the thrill of the Arctic experience, but the momentum of change as solid ice dissolves—the glories of the frozen north and the inexorable process of ecological transformation. 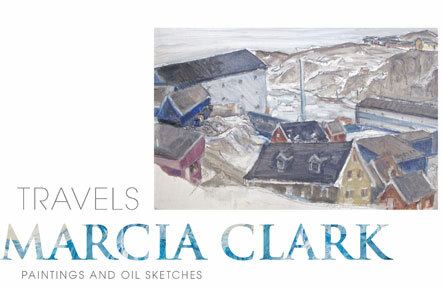 Marcia Clark's paintings feature Arctic landscapes, visited on journeys to Greenland, Iceland and Arctic Norway. The glaciers, icebergs, and ensuing, detritus convey the very omens that currently haunt us, as she witnesses ice, appearing solid as a mountain, deconstruct, melt, or suddenly vanish. Ice in its fragility and beauty, and the Arctic winter, with its vibrant electrically charged night skies, are the focus of this show, in small studies on aluminum, Mylar and canvas, and larger works incorporating multiple panels and mixed media. 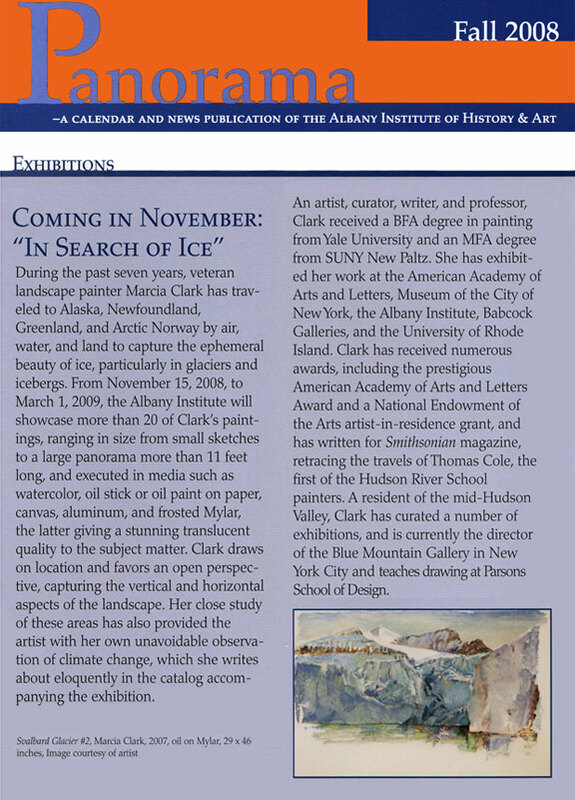 Marcia Clark’s paintings in this traveling exhibition reflect her recent travels to the Arctic. In 2006 she visited Norway’s Svalbard Archipelago and in 2007 she was in northwest Greenland as artist in residence at the Upernavik Museum. 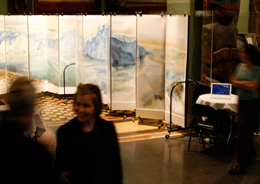 Her focus in this exhibition is on the forever fluctuating, mutating, and transforming nature of the polar ice. Ice, Iceberg, Baffin Bay, shown above, was painted last spring in Upernavik. “The large iceberg in the distance was there when I arrived,” said Clark, “and seemed as permanent and solid as a mountain until it suddenly disappeared a couple of weeks later.” Another image that remained vivid from her travels was an ice tower which a French visitor referred to as “Notre Dame.” It sat at the entrance to the Jacobshaven Fiord for over a month until it sailed off and was seen in the distance a few hours later, disappearing behind a spit of land. Clark is a widely exhibited artist and the recipient of numerous awards. She has a BFA degree in painting from Yale University and a MFA degree from SUNY New Paltz.